I’ve blogged quite a lot about customer service in the last year. 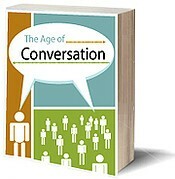 Reading The Age of Conversation, Ann Handley’s contribution ‘How many people are you talking to?’ rang a lot of bells with me. Ann wrote about one simple conversation (between nervous flyer Ann and a reassuring United Airlines attendant) achieving a ‘laundry list of objectives’ – establishing a personal connection between her and the airline, investing her fully in the brand and giving her the information she needed to feel secure in the air. Ann’s point was that because she is a business writer and blogger, in this Age of Conversation, one exchange has the potential to influence many. And you never know who that person (staff or customer) might be. Everyone on both sides of the Conversation now has a voice and can be heard and can influence. So brands really need to be sure that their people are their evangelists – because you never know how many people they’ll be talking to.